Put our toes in the waters of Atrocity Tourism this morning. We started with the only Jewish synagogue that survived World War II in Warsaw, which was lovingly restored but seemed a bit antiseptic. As one of our hostel-mates observed yesterday, Poland's Jewish sites have the feel of "here's where Jews USED to live." Then it was to Pawiak Prison, built by the Tsar in 1830-35 (not sure which czar), but best utilized by the Nazis. During World War II, the Germans imprisoned 100,000 Varsovians (people of Warsaw) there, killing an average of 20/day. That was a statistic that helped me wrap my mind around the program. Then they shipped another 30,000 or so out to the death camps. It seemed that Pawiak was not used for Jews, who were all in the Ghetto, and got shipped out separately. All that's left of the prison are a few cells -- the Germans blew up the rest when they blew up most of Warsaw. But the cells alone were difficult. Then, on to the Ghetto sites. The current neighborhood around the Ghetto is, well, nice. Quiet apartment blocks, pleasant trees, and few reminders of the horrors of the war. 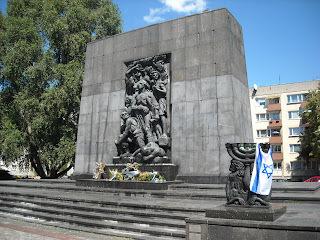 There is a large memorial to the Jewish fighters in the doomed Warsaw Ghetto Uprising of 1943 (above) as well as another, less grandiose memorial, and a marker on the spot where German Chancellor Willy Brandt knelt to ask forgiveness for the crimes of Germany against Poland. There's also a big memorial to the train station where 300,000 Jews from the Ghetto were shipped to the death camps, but no train station. Just a nice apartment building. Must be an odd place to live, even if you don't believe in ghosts. This afternoon was lighter. 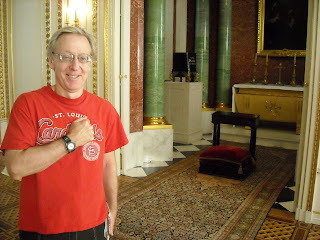 Checked out the Royal Palace, which is very odd. The Germans flattened it (naturally), so the Communist government of Poland rebuilt the Royal Palace to commemorate a government that it despised! Go figure. We did find the urn of ashes of Tadeusz Kosciuszko, a Polish freedom fighter in the American Revolution who came back to Poland to lead an unsuccessful rising in 1791. 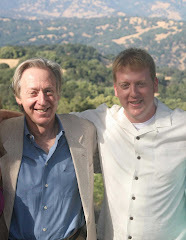 (Photo of me with Tad, above). Then no Sunday in Poland is complete without a stop at church. We caught the final portions of late-afternoon mass, then scampered into Sacred Heart Church to observe the site that contains the heart of Frederic Chopin. Tomorrow, we head out of town with a guide to look into some family history sites. You blog is better than any summer television. I hope I am among millions following your every step or, maybe I should say, your every pedal.